To help raise awareness of the plight of over 100,000 Australians sleeping rough every night, Lanz Priestley, the mayor of ‘Tent City’ and founder of homeless organisation Sydney Homeless, together with Clemenger BBDO Sydney, has launched Street-Life View, an interactive website that lets you walk through Sydney’s Tent City despite its recent removal. Martin Place may be clear of the homeless this week, but the people of Tent City and thousands like them still need help. The website uses technology similar to Google Street View to show the real situation on the streets, not just for Sydney-siders, but the whole country. Most people find talking to the homeless difficult, but Street-Life View allows you to explore Tent City and not just see homelessness first-hand, but also meet the people who lived there, understand them and find out what you can do to help their cause. Over the past six months, many of Sydney’s homeless took up temporary residence in the city’s CBD to gain attention for the need many have for food and shelter in a safe community environment. This prominent reminder of the homelessness crisis has finally put the issue on the national agenda. According to Homelessness NSW, the number of people rough sleeping in Sydney has increased by 28 per cent since 2011. A survey in February this year found 433 people were sleeping rough in the city, while crisis accommodation services were 90 per cent full. While the government and city council fight over who’s responsible, all it takes is for decent people to act. Street-Life View aims not only to keep housing affordability on the national agenda, but also act as a rallying cry for direct action, encouraging Australians to take the issue to their local MP and demand action. Ben Coulson, chief creative officer at Clemenger BBDO Sydney, said: “Homelessness doesn’t go away when protesters are removed from sight. Street-Life View does its bit to make sure these people are not forgotten. Lanz Priestley sold his own home in eastern suburbs 20 years ago so he could give his own children, the eldest 47 years old, deposits to buy houses. 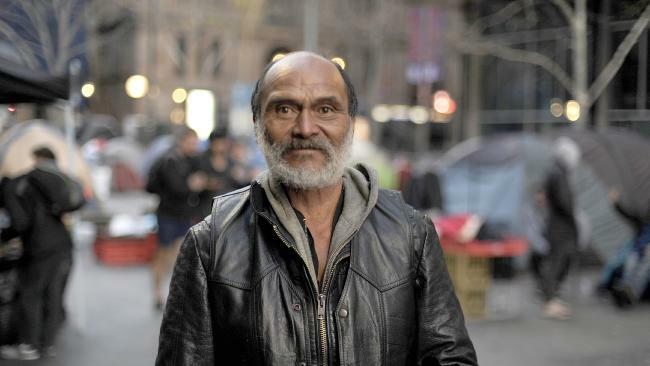 He has been living on the streets in the financial heart of Sydney since 1991.